When all through the house not a creature was stirring, not even the pups. I don't know about your dogs, but my boys sleep well at night, waking only when outdoor noises bring them to their feet to do their "guard dog" thing, aka alert barking. Oliver tends to hear these noises first, waking Tanner who then proceeds to check each window and door, barking as he goes, letting would-be intruders know there is a large Fido on duty. I feel pretty safe! Does your Fido need a reward for doing his job of protecting your home and alerting you to potential dangers? Of course he does! And you've come to the right place. 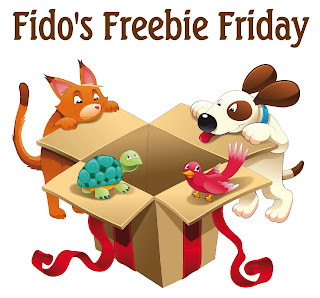 Fido's Freebie Friday is open 24/7 with a weekly assortment of free goodies for both you and your dog to enter. We hope you'll join us each week to see what's new. •PLEASE add an end date to your listing. You have up to 45 characters to describe your prize and include an expiration date. •Fido's Freebie Friday Blog Hop is open to posts with prizes for pet products or services, including pet-related or pet-themed items for owners. Link up using your specific post url to make it easier to find. •Please include our badge or a link to this post in your giveaway write up, and ask your readers to tell us who sent them. You'll find assistance at our HELP PAGE, where there is a ton of other useful information for bloggers doing giveaways and reviews. Your hosts are All Things Dog Blog, Doggies and Stuff, and Dogtipper. Thank you for taking the time to read this post. I hope you will forward it to friends as well. Simply click on the cute little envelope icon at the bottom of the post to email this to anyone you wish. Wishing you, Tanner, Oliver and the family a happy holiday! If you want to gift some more rewards for your dogs, then biteem is a one stop shop for cute little dogs.